Since the day Amazon came out with their own tablets, they were a big hit. They are listed as one of the top selling products in Amazon.com, a site which sells large volumes of everything everyday. Those tablets are branded as Kindle. There are several versions of Kindle available in the market. Each one is different from another one in terms of storage space, screen size, internal hardware and their capabilities. The newest brand in line of Kindle products is the Kindle Fire HDX. Kindle Fire HDX is a third generation tablet that was just introduced on September 25, 2013. There are two models of the tablet: a 7 inch model and a bigger 8.9 inch model. Right now just the announcement of the tablets have been made and they will start shipping soon. Just give a few weeks and the tablets will be in the hands of consumers. The first thing to know about these tablets is that their operating system is not the stock Android or anything close to it. Their operating system is titled Mojito 3.0 OS and is based on Android 4.2.2. That means that the operating system has its own user interface, apps and everything else. With Mojito 3.0 OS you do not get the wonderful Google Apps and Play Store that comes bundled with most Android devices. Instead you get Amazon's own proprietary apps. You wont get Play Store but you will have Amazon's own bookstore and Amazon Appstore. There is a presence of several other stock Amazon apps. Android users will find lots of new things with this OS. With the different size of these two tablets, the resolution for them are also different. 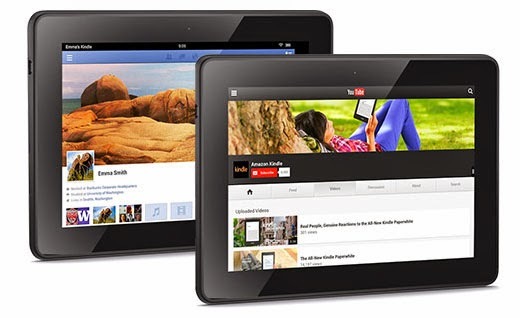 The 7 inch tablet has 1920X1200 screen resolution while the 8.9 inch version has 2560X1600 screen resolution. Another difference in specs and design between these two is the camera. The 7 inch version has only one front facing camera while the bigger one has an additional 8 Mega Pixels rear camera. Both HDX versions come with just WiFi or with WiFi and 4G. The prices depend upon these features and the storage available. Price for 7 inch model ranges from $229 to $324. The price for the 8.9 inch model ranges from $379 to $594. Prices might change in the future along with offers. Are you interested in this alternative Amazon's Android Tablet or are you going to stay with Android's tablets like the ones in the Nexus line?